Do you feel overwhelmed by choosing colours for your interior decor projects? AND making your colour palette work with pattern and texture? OK so if you saw last week's blog post you'll know I'm about to switch up my studio/office space with a little revamp. I've been thinking long and hard about the colour scheme and kind of been driving myself crazy thinking about all the potential colour combinations I want to use. I know I want a pink on the walls but I need to choose other colours that go with the wall colour for the rug, blinds, furniture, oh and the shelving. I want a colourful space but it needs to be HARMONIOUS and calming which means I need to get the colour combo spot on and make sure it all works together. 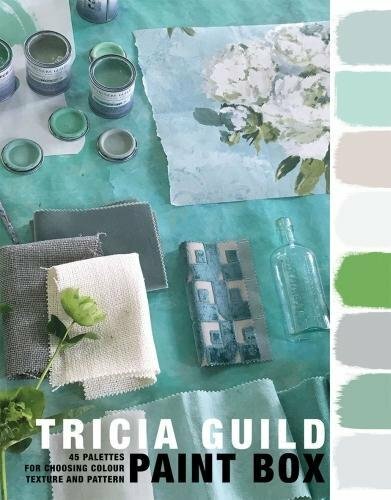 ENTER THE NEW BOOK ON COLOUR BY TRICIA GUILD - "PAINT BOX"
Plagued by a bout of indecision I thought I would enlist the help of colour expert Tricia Guild of Designers Guild. Her most recent book called "Paint Box" has 45 colour palettes for choosing colour, texture and pattern and I am completely engrossed in it since it arrived a few days ago. If you're about to start a decor project and are confused on choosing colour combinations then this is the answer to your prayers. As much as colour is an instinctive and creative thing and some rules should be broken, colour is a science! I really consider it to be an amazingly helpful book when it comes to decorating a space and choosing colour. 1. THE COLOURS PALETTES ARE STUNNING - From bold shades inspired by Autumn to the timeless black and white palette and plenty of neutrals in between, there is a colour palette to suit every taste. Pick one colour as your dominant colour and every other colour in that palette will work with it. 2. USEFUL INFORMATION ON HOW TO PUT COLOUR TOGETHER - It's all very well showcasing a set of lovely colours but how you go about mixing them to create a scheme? There is some fab information on how to create balance, definition and how to, for example, toughen up a colour like pink by adding touches of denim or make it more feminine by adding lilac. I love the info on how to build on the palette with texture and pattern too, this is so so handy as bringing in more colour and pattern to a room can often feel very daunting. 3. THE LAYOUT - The simple navigation and straightforward style of the book is what I love most. It's like a really good recipe book with just enough text to give you the vital information and ideas about the colour palettes as well as stunning photography to inspire the layout and styling of a room. 4. SUITABLE FOR ANY TASTE - It's obviously full of Designers Guild paints and fabrics but is totally adaptable to suit any taste and style. Although most of the mood boards feature pattern, you can totally work with purely plain colours following the palette ideas. 5. PALETTE DIRECTORY - There is a really handy palette directory at the back of the book which means you can look at a glance at the colours combinations. I've taken a photo of the palette I want to use as a useful reference to keep on my phone. 6. UPLIFTING AND INSPIRING - By the time you have read just a few pages of this gorgeous book you'll be so inspired to go and buy some paint colours and get cracking with a project. It definately gives you confidence to use colour and potentially try new colours you may not have considred before. 7. THE PERFECT AUTUMNAL READ (& CHRISTMAS PRESENT) - This is the book I'm reading by the fire as the nights draw in closer. There is lots to learn about colour without the scientific colour wheels. I really think this is a decorating bible and believe it can help anyone plan and nail their colour combos for interior design and decor projects. So what do ya think? have you bought this book yet?